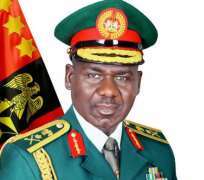 The Chief of Army Staff,COAS, Lt.-General Tukur Yusuf Buratai, has asserted that the suits instituted against the Nigerian Army over human rights violations were meant to distract it from carrying out its constitutional role of defending the territorial integrity of the country. Buratai stated this yesterday in Abuja at the opening of a two-day 2018 “Nigerian Army Law seminar” organised in collaboration with the National Judicial Institute (NJI). He also noted that the fight against terrorism and insurgency, especially in the North-east, had pre-occupied the minds of the many Nigerians, and had been the concern of the international community, but assured that the army would adhere to the provisions of the constitution in dealing with the menace. Lt. Gen. Buratai added also that the army had ensured that the fundamental human rights of citizens were adequately protected in all exercises and operations. “Since my assumption of office in 2015, my Principal Staff Officers and I have been monitoring issues on allegation of human right abuses against troops deployed for operations across the country in line with the President and Commander-In-Chief of the Armed Forces’ mandate to the Nigerian armed forces in the fight against terrorism," Buratai said. “So far, we have been able to address petitions and other different kind of claims against the Nigerian Army through the establishment of Human Rights Desk offices in the Army Headquarters and across the Nigerian Army Divisions. “The human rights desk has special hotline for citizens who have genuine claims, complaints and petitions to make against the Nigerian Army in order to report natural disasters or to report any act of terrorism, among others. “The Nigerian Army has also ensured that all cases pending in civil court against it are either assigned to competent registered Nigerian Army external advocates or military lawyers in the Directorate of Legal services. “Court Martial cases or trials in the field are also given professional attention by deploying legal officers, who are not only trained military personnel, but legal practitioners. “The Nigerian Army, as an institution, is guided by appropriate legal advice in sustaining its flexibility in the conduct of its operations, and this has been adequately acknowledged within the nation and the comity of other nations. “Adherence to the rule of law is consistent with my vision which is to have a “professionally responsive Nigerian Army in the discharge of its constitutional roles", Buratai said. In his remark, the Chief Justice of Nigeria, CJN, Justice Walter Onnoghen, said that terrorism and counter terrorism have been major security threats globally. Onnoghen, who was represented by Justice Kudirat Kekere-Ekun, a Justice of the Supreme Court added that in spite of this, the place of the rule of law in a society could not be overemphasised. “In a democratic system of government, it is the rule of law that dictates the pace at which human beings interact among themselves. Therefore, respect for fundamental human rights of citizens is sacrosanct,” he said. He stressed the need for members of the armed forces to obey the rule of law in their operations. “This is because the business of bearing arms or defending the nation involves life and death for both regular forces and citizens. There have been allegations and cases of human rights abuse against the military in its efforts to stamp out terrorism and insurgency in Nigeria.